Map of the United States with North Carolina highlighted. Union propaganda showing North Carolina's Seal being held by the Devil. Some white North Carolinians, especially yeoman farmers who owned few or no slaves, felt ambivalently about the Confederacy; draft-dodging, desertion, and tax evasion were common during the Civil War years, especially in the Union-friendly western part of the state. North Carolinians, often in disagreement with the aristocracy of eastern planters, raised about 25,000 troops from the western counties to fight and occupy territory in the mountain region of North Carolina and Tennessee, as well as the coastal plains of North Carolina, sometimes with troops from other states. Central and Eastern white North Carolinians were more enthusiastic about the Confederate cause; North Carolina contributed more troops to the Confederacy than any other state. Initially, the policy of the Confederate populace was to embargo cotton shipments to Europe in hope of forcing them to recognize the Confederacy's independence to resume trade. The plan failed, and furthermore the Union's naval blockade of Southern ports drastically shrunk North Carolina's international commerce via shipping. Internally, the Confederacy had far fewer railroads than the Union. The breakdown of the Confederate transportation system took a heavy toll on North Carolina residents, as did the runaway inflation of the war years and food shortages in the cities. In the spring of 1863, there were food riots in Salisbury. Differing ideologies turned into opposing loyalties, and those divisions eventually proved as disruptive as anything imposed by outside armies....As the mountains came to serve as refuges and hiding places for deserters, draft dodgers, escaped slaves, and escaped prisoners of war, the conflict became even more localized and internalized, and at the same time became far messier, less rational, and more mean-spirited, vindictive, and personal. Fighting continued in North Carolina sporadically throughout the war. In 1864, the Confederates assumed the offensive in North Carolina, trying to recover some of the territory lost to Burnside's expedition. They failed to retake New Bern, but reconquered Plymouth and held it for 6 months. Moreover, the Union army launched several attempts to seize Fort Fisher. In the war's closing days, a large Federal force under General Sherman marched into North Carolina, and in a series of movements that became known as the Carolinas Campaign, occupied much of the state and defeated the Confederates in several key battles, including Averasborough and Bentonville. The surrender of General Joseph E. Johnston's Confederate army at Bennett Place in April 1865 essentially ended the war in the Eastern Theater. 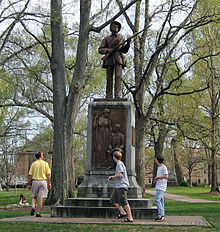 "Silent Sam" Confederate memorial on the UNC-Chapel Hill main campus. Henry Toole Clark served as the state's governor from July 1861 to September 1862. Clark founded a Confederate prison in North Carolina, set up European purchasing connections, and built a successful gunpowder mill. His successor Zebulon Vance further increased state assistance for the soldiers in the field. As the war went on, William Woods Holden became a quiet critic of the Confederate government, and a leader of the North Carolina peace movement. In 1864, he was the unsuccessful "peace candidate" against incumbent Governor Vance. Unionists in North Carolina formed a group called the "Heroes of America" that was allied with the U.S. Numbering nearly 10,000 men, a few of them possibly black, they helped Southern Unionists escape to U.S. lines. ^ John C. Inscoe and Gordon B. McKinney (2003). The Heart of Confederate Appalachia: Western North Carolina in the Civil War. Univ of North Carolina Press. p. 9. ^ Brooks D. Simpson (2013). The Civil War: The Third Year Told by Those Who Lived It: (Library of America #234). Library of America. p. 193. ^ R. Matthew Poteat (2009). Henry Toole Clark: Civil War Governor of North Carolina. McFarland. pp. 90–118. ^ Foner, Eric (March 1989). "The South's Inner Civil War: The more fiercely the Confederacy fought for its independence, the more bitterly divided it became. To fully understand the vast changes the war unleashed on the country, you must first understand the plight of the Southerners who didn't want secession". American Heritage. Vol. 40 no. 2. American Heritage Publishing Company. p. 3. Archived from the original on January 3, 2015. Retrieved December 18, 2013. Barrett, John G. The Civil War in North Carolina. (University of North Carolina Press, 1963). Barrett, John Gilcrest. The Civil War in North Carolina. (North Carolina Department of Cultural Resources, 1984). Carbone, John S. The Civil War in Coastal North Carolina. (North Carolina Division of Archives and History, 2001). Clinard, Karen L. and Richard Russell (eds.) Fear in North Carolina: The Civil War Journals and Letters of the Henry Family. (Winston-Salem, NC: John F. Blair Publishing, 2008). Erslev, Major Brit K. Taming the Tar Heel Department: DH Hill and the Challenges of Operational-Level Command during the American Civil War (Pickle Partners Publishing, 2015). Hardy, Michael C. North Carolina in the Civil War. The History Press, 2011. Inscoe, John C. and Gordon B. McKinney. The Heart of Confederate Appalachia: Western North Carolina in the Civil War. (University of North Carolina Press, 2000). McSween, Murdoch John. Confederate Incognito: The Civil War Reports of" Long Grabs," aka Murdoch John McSween, 26th and 35th North Carolina Infantry (McFarland, 2012). Mobley, Joe A. Confederate Generals of North Carolina: Tar Heels in Command (Arcadia Publishing, 2012). Myers, Barton A. Rebels Against the Confederacy: North Carolina's Unionists. (Cambridge University Press, 2014). Poteat, R. Matthew (2009). Henry Toole Clark: Civil War Governor of North Carolina. McFarland. pp. 90–118. Reid, Richard M. Freedom for Themselves: North Carolina's Black Soldiers in the Civil War Era. (University of North Carolina Press, 2008). Smith, Blanche Lucas (1941). North Carolina's Confederate monuments and memorials. North Carolina Division, United Daughters of the Confederacy. This page was last edited on 16 March 2019, at 06:46 (UTC).